Many people wonder what are those white stripes, which almost every day can be seen in the sky. That is a condensation trace or ‘Chemtrails ‘. They remain in the sky for a while and after certain time disappear as they never were there. Scientists and officials have never confirmed, but conspiracy theorists are very confident and have many explanations. Conspiracy theories have always been interested and fascinated for people. But the conspiracy theory of “Chemtrails ” is one of the most famous today. Chemtrails-chemical traces, are left behind by unmarked and unidentified planes. They do not consist of water vapor. Their chemistry is not fully known. But a number of private laboratories through environmentally conscious people made some analysis. According to these findings, the composition of chemtrails is discovered and can be said that it includes a rich variety of chemical compounds and heavy metals. What is even more interesting, they contain micro-organisms, viruses and prions, an extremely dangerous biological component. 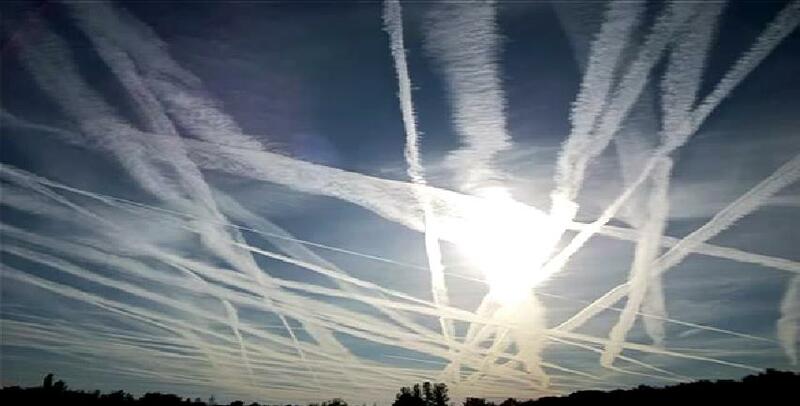 Chemtrails unlike contrails (clouds formed when water vapor condenses and freezes around small particles ‘aerosols’ that exist in aircraft exhaust) remain for a few hours in the sky or almost entire day. This so called phenomenon has been registered more than 30 years ago, but the last decade is more intensified. Neither the US government or any government of any other country is not talking about it. Many environmental organizations are trying to break up information, but all of information that they come to, are only those achieved through private laboratories. Independent researchers from USA, Canada, Germany, Italy, France, Australia and other countries have found that chemical traces contain compounds that are anything but safe. In chemical traces were found certain heavy metals, bacteria, fungi, pesticides, mycoplasma as well as some forms of artificial life generated nanobiotechnology. Award winning Canadian investigative journalist and unquestioned authority with over thirty years of experience-William Thomas, who was the first who informed the public about the chemical traces, wrote a whole series of articles and a book on chemtrails, and also has recorded a documentary. On his website can be found many research, reports and latest findings about the chemical traces. Mr. Thomas is the first who conducted a chemical analysis on a samples taken after spraying, which later, many other researchers confirmed his results. Fiber, brown or white color, similar to cobweb etc. You can see lot of photos on internet of the interior of aircraft with built-metal tanks instead of passenger seats with chemicals that are released around the world. You can see the photos of different nozzles, which are positioned on the tail, the floor or the side wings of the aircraft. On Internet also could be found video footage from the airplanes in action during the spraying of chemical compounds to which it is clear that chemical spraying come out of the wings and fuselage, and not from the turbine. For end, just to add that on a regions in which there is frequent and more often spraying, is registered a large number of people suffering from respiratory diseases, and a significant jump in mortality. It is assumed that the hazardous components found in chemtrails under certain environmental conditions cause a real pandemic and mortality rate. The most common symptoms from this chemical traces are: persistent cough, problems with the upper respiratory tract and digestive disorders, pneumonia, extraordinary fatigue, lethargy, dizziness, disorientation, loss of concentration, headaches, a burning sensation in the eyes, pain in joints and muscles, stiffness neck, nose bleeds, depression, anxiety etc.